Suave Moroccan Infusion Color Care Shampoo – I don’t know how many of these I’ve purchased. When you have color-treated hair and you also don’t wash your hair every single day, getting moisture during each wash is very important. I do like to rotate this with a more clarifying shampoo because this is better at leaving your hair feeling nourished than actual cleansing. Actually I have been a fan of the method of conditioning first and then shampooing with a clarifying shampoo as a second step, and even going back in with the moisturizing shampoo and then re-conditioning. (Very into moisturizing! It doesn’t need to be used that way though, you could definitely just alternate using this on days your hair some needs extra hydration.) This shampoo is cheap as chips and gets the job done. Nip & Fab Glycolic Fix Exfoliating Facial Pads – I actually finished two of these, but one of them somehow ended up getting misplaced and thrown out in the trash. This is a mini-trial size I found when they were on sale at CVS and curiosity got the better of me. I liked these decently enough, I found that they worked a little more gently than the Pixi Glow Tonic which is similar (for reference, the Nip & Fab pads have 2.8% glycolic acid and the Pixi Glow Tonic has a full 5%) in terms of making your skin more toned, smooth, and radiant. (Which is what a glycolic toner is great for, if you are unfamiliar). I found I could use them both day and night, which is the same as I do with the Pixi GT.. I did have to use two sheets to cover both sides of my face and online reviews I found on Ulta suggest I would need to the same with the full-size version. In the future I would go re-purchase the Pixi Glow Tonic as it is more bang for your buck. Benefit Erase Paste in No. 2 medium – This is a great workhorse product, did wonders for my under eye circles as a concealer with a peachy undertone; it is a bit on the thick side though. I stopped using it as I found less use for peachy corrector in my routine and had to toss it because it was getting old. Found though that at the moment they have brought it up back under the new name “Bo-ing Brightening Concealer” “Full Coverage, Color Correcting Concealer” with rumor of new shades though and I would be interested at giving them another go. L’oreal Brow Stylist Definer in Dark Brunette – A great skinny brow pencil and awesome dupe for the Anastasia Brow Wiz, it’s good for tracing a precise shape around your brows and for detail work. I actually already have another one of these because I lost it at one point and I can’t be without this. The color is quite dark though (and I have quite dark roots/natural brows ) and I have been having a harder time finding a lighter shade in my area (I have only seen the shade medium a few times in my area though there are more shades available online). I was looking for a lighter shade because sometimes I do like to fill in my brows a lighter color, but I will continue to repurchase the shade in Dark Brunette because I do like it so much. Tree Hut Shea Sugar Body Scrub in Tropical Mango – I got this when Ulta was having some kind of ‘Buy 1 Get 1’ at some sort of discount kind of deal. I mostly like these for the scent. They do have some scrubby granules, and I do like that they are a sugar scrub as sugar scrubs melt well into the skin. 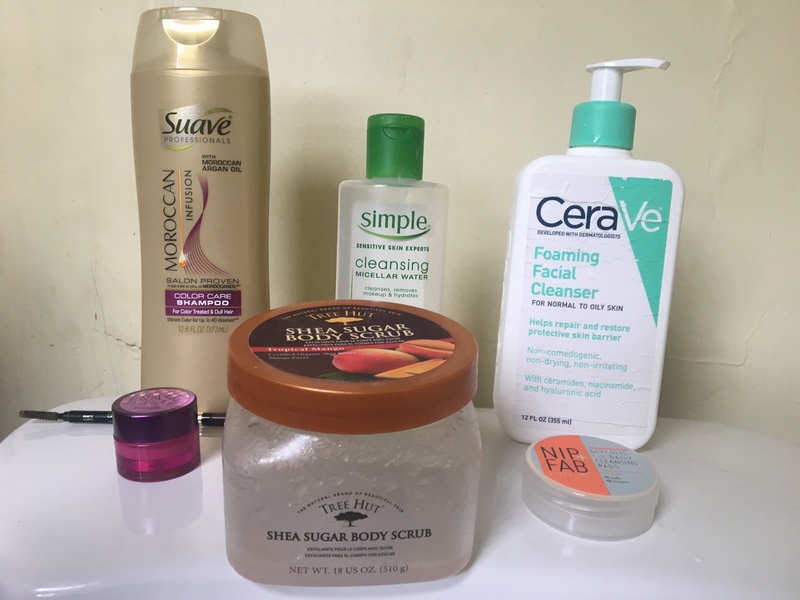 They do work, but I’ve noticed that in general I do prefer body scrubs that come in a tube vs. a jar as the water from the shower does tend to get stuck in the container when I am using it thus making the rest of the product left in it unusable. I would rather purchase a scrub that comes in a tube in the future instead though I might pick one of these up again if I was unable to find one or if they were on sale. Simple Cleansing Micellar Water – I thought this worked decently enough. This was gentle and lightly, but pleasantly scented. The scent is clean and subtly almost herbal smelling (not like the Origin’s skincare if you’ve smelled that before, which I actually don’t mind although it does smell more earthy. This just has something about it that smells natural which I thought I’d mention as I know some of you like to avoid scented skincare). I like the Garnier micellar water and there’s also one called ‘All Bright’ from Boots that I like more than this. This one took the makeup off my face alright but I found that it stung my eyes somewhat though I did end up finishing the bottle. I would definitely recommend purchasing either the Garnier or the Boots micellar water if you’re looking for one in the future, though this was not terrible. Cerave Foaming Facial Cleanser – I have mixed feelings about this cleanser. I was looking to replace my Simple Foaming Cleanser, which I have went through too many bottles of to count. Being a foaming cleanser, it took off my makeup thoroughly and gently. and it was also great at keeping my PH levels even, and my skin very clear. At first, I did really enjoy this Cerave cleanser as it was gentle and did clean very effectively, and it did keep my skin relatively clear of blemishes.